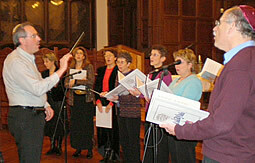 The Or Hadash Makaylah is a unique, all-volunteer community of roughly 20 men and women of diverse ages, backgrounds and professions who all share a common love of Jewish music and singing together. We have a standard repertoire of over one hundred, mostly a capella, 4-part harmony prayers set to beautiful melodies written by top composers and arrangers of Jewish music such as Debbie Friedman, Jeff Klepper, and Gil Aldema. Makaylah members have also written and arranged original music and lyrics for us to sing in both Hebrew and English. Rehearsals are held twice a month in singers' homes and always include time for socializing and refreshments provided by the host. The Makaylah sings once a month at Friday night services, throughout the High Holy Days, and by request at special life-cycle events such as Bar and Bat Mitzvah ceremonies. As a Havurah, this close-knit group of friends organizes dinners, BBQ's and sing-alongs with one another and our extended families throughout the year. The Makaylah has sung annually at the Jewish Choir Festival of greater Philadelphia, which our Director-Arranger, Dr. Barry Brian, has helped to organize, and we have partnered with the New Life Presbyterian Church Choir to perform jointly at both our synagogue and their church around the Martin Luther King, Jr. holiday, singing music that combines the universal messages shared by Christian and Jewish liturgy. Or Hadash congregants make a special effort to attend services and programs at which the Makaylah is singing, as so many appreciate the added beauty and harmonies the choir brings to our already vibrant, music-filled services.